Welcome to the Kellylab blog! We post fun facts and things that catch our eye. Occasionally I wax lyrically about a topic of interest. Many of us have watched in horror and sadness over the previous week as fires consumed much of the beautiful hills and parts of the towns of Napa and Sonoma Counties. Many of us know people who were evacuated with a few minutes’ notice - I met a retired man who left his retirement home with the clothes on his back. Many other friends lost everything - house, car, pets. It was a terrible event - or series of events as there were many active fires. During those 8+ days all of us were glued to our screens searching for up-to-date and reliable information on where the fires were, and how they were spreading. 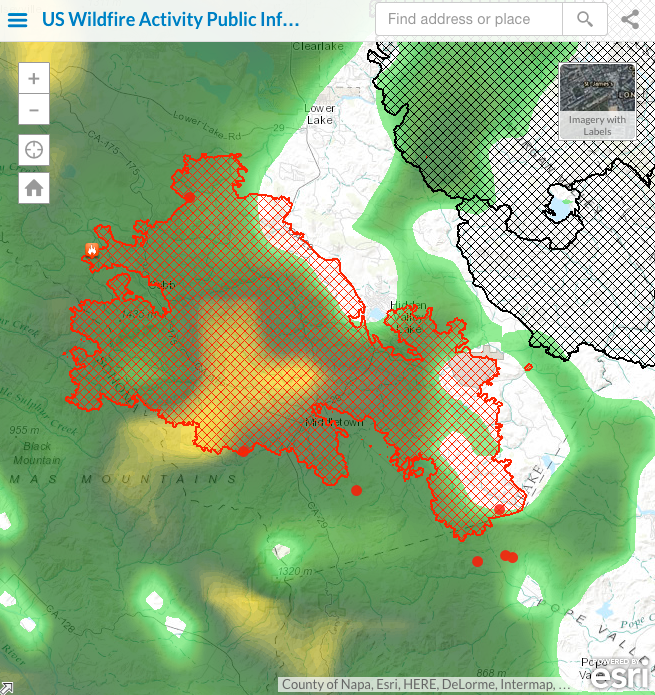 This information came from reputable, reliable sources (such as NASA, or the USFS), from affected residents (from Twitter and other social media), and from businesses (like Planet, ESRI, and Digital Globe who were sometimes creating content and sometimes distilling existing content), and from the media (who were ofen using all of the above). As a spatial data scientist, I am always thinking about mapping, and the ways in which geospatial data and analysis plays an increasingly critical role in disaster notification, monitoring, and response. I am collecting information on the technological landscape of the various websites, media and social media, map products, data and imagery that played a role in announcing and monitoring the #TubbsFire, #SonomaFires and #NapaFires. I think a retrospective of how these tools, and in particular how the citizen science aspect of all of this, helped and hindered society will be useful. Accuracy – how accurate are these data? How do we evaluate them? Access – Who has access to the data? Are their technological limits to dissemination? Bias (sampling issues)/Motivation (who contributes) are critical. Effectiveness – how effective are the sites? Some scholars have argued that VGI can be inhibiting. Control - who controls the data, and how and why? Privacy - Are privacy concerns lessened post disaster? I think I am most interested in the accuracy and effectiveness questions, but all of them are important. If any of you want to talk more about this or have more resources to discuss, please email me: maggi@berkeley.edu, or Twitter @nmaggikelly. Summary so far. This will be updated as I get more information. ANR has a number of programs dedicated to fire preparedness, recovery, and prevention. 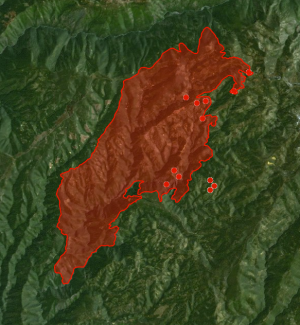 MODIS hot spots from USFS Active Fire Mapping Program. MODIS The MODIS instrument is on board NASA’s Earth Observing System (EOS) Terra (EOS AM) and Aqua (EOS PM) satellites. In addition to lots of other data, MODIS delivers Channel 31 brightness temperature (in Kelvins) of a hotspot/active fire pixel. Flickr: SonomaFires, TubbsFires, NapaFires, etc. LandFire is looking for field data! Add yours now. I wanted to send out a friendly reminder that the data submission deadline for the current data call is March 31, 2016. Data submitted before March 31 are evaluated for inclusion in the appropriate update cycle, and submissions after March 31 are typically considered in subsequent updates. This is the last call for vegetation/fuel plot data that can be used for the upcoming LANDFIRE Remap. If you have any plot data you would like to contribute please submit the data by March 31 in order to guarantee the data will be evaluated for inclusion in the LF2015 Remap. LANDFIRE is also accepting contributions of polygon data from 2015/2016 for disturbance and treatment activities. Please see the attached data call letter for more information. Been addicted to the ESRI fire feed for its integration of numerous data sources. Here is the Valley Fire currently, and the rain that just hit us has moved north. The King Fire is out, but it leaves us with alot to ponder. It started September 13 and quickly jumped on a northward run through National Forest and private forestlands. At the end, it burned 97,717 acres. 12 houses and several other minor structures were lost. More worrying is the fact that it burned through many California Spotted Owl PACs in the Eldorado National Forest. We are waiting to hear from the SNAMP Owl team on what their assessment of the situation is. In the meantime, here is a map of burn severity for the fire, made by Stefania from data from the USFS. Clearly it burned hot. 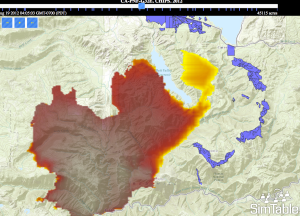 Blodgett looks like it is going to be OK, but the King fire is burning through the SNAMP Eldorado study area. This is where the SNAMP owl reasearchers are doing their work. We are getting a response from them to post on the SNAMP website. We will keep our eyes on it. And Happy 100th Anniversary Berkeley Forestry! From UC Center for Forestry. 9/16 16:30 - The King Fire started the evening of September 13 east of Pollock Pines. On 9/15, it grew to 3,900 acres. By the morning of 9/16, it was over 11,000 acres and 5% contained. As of the afternoon of the 16th, the fire is alarmingly close to Blodgett Forest Research Station. All staff are being evacuated. We will provide updates here as they come in. We anticipate the perimeter update will be updated every 24 hours in the early morning (as the data becomes available). The last update was 9/16 at 10:00AM. It's now on Inciweb. The Meadow fire is burning near Yosemite, at the east of Little Yosemite Valley. The Meadow Fire has progressed rapidly and in multiple directions. In order to maintain the safety of park visitors and allow fire management operations to continue unimpeded, the Superintendent of Yosemite National Park is designating a portion of Yosemite Wilderness as closed. The area will be closed until further notice is given. "Meadow (37 42.738 x 119 30.541 – Mariposa Co., 7,870’, August 16) A fire, that may be a spot fire, from the Meadow lightning-caused fire, was discovered at approximately 12:30 PM, Sunday September 7. The fire is approximately 2,582 acres. 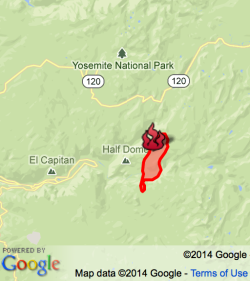 It is burning within the Little Yosemite Valley (LYV) on both sides of the Merced River. All trails in the area are closed. Approximately 100 hikers and backpackers were evacuated from the fire area in LYV. The fire is burning in Yosemite Wilderness. The High Sierra Camps were seasonally closed today." Scott Stephens says it is growing fast. We will keep our eyes on it. Former student and GIS expert Chippie Kislik alerted me to this video. She is working with others at NASA Ames on a Sierra Nevada DSS Ecological Forecasting Project. A video about the project is here. The Sierra Nevada contains vital ecosystems that are experiencing changes in hydrologic regimes, such as decreases in snowmelt and peak runoff, which affect forest health and water resources. Currently, the U.S. Forest Service Region 5 office is undergoing Forest Plan revisions to integrate climate-change impacts into mitigation and adaptation strategies. However, there are few tools in place to conduct quantitative assessments of forest and surface conditions in relation to mountain hydrology, while easily and effectively delivering that information to forest managers. To assist the Forest Service, this research team created a Decision Support System (DSS) featuring data integration, data viewing, reporting, and forecasting of ecological conditions within all Sierra Nevada intersecting watersheds. How does the USFS map vegetation post fires? The discussion of how the USFS deals with fires on public forests came up strongly in our recent SNAMP Public Meeting. Our Last Change field site burned in October, and we are very interested in understanding the behavior and impact of the American fire. Part of the discussion stemmed from this presentation on preliminary estimates for fire intensity, ascertained partly from analysis of WorldView imagery delivered at our SNAMP meeting. For more on the SNAMP presentation, check out our website. The website (linked below) offers an initial description of post-fire vegetative conditions using the Rapid Assessment of Vegetation Condition after Wildfire (RAVG) process. RAVG analysis looks at fires that burn more than 1,000 acres of forested National Forest System (NFS) lands, beginning with fires that occurred in 2007. These fires result in direct losses of vegetative cover and many of the benefits associated with forested ecosystems. NFS lands experience thousands of wildfires every year, most of which are relatively small. The largest fires typically account for 90% of the total acreage burned. RAVG analysis provides a first approximation of areas that due to severity of the fire may require reforestation treatments. These reforestation treatments would re-establish forest cover and restore associated ecosystem services. This initial approximation could be followed by a site-specific diagnosis and development of a silvicultural prescription identifying reforestation needs. Post Fire Vegetation Mapping process that the Forest Service Uses http://www.fs.fed.us/postfirevegcondition/index.shtml. Specific to the methodology of the RAVG program can be found at: http://www.fs.fed.us/postfirevegcondition/whatis.shtml. Also, here is the Field Guide for Mapping Post-Fire Soil Burn Severity. A nice press release about our new paper on the concepts behind a fire detection satellite with perhaps the coolest acronym yet: FUEGO — Fire Urgency Estimator in Geosynchronous Orbit. From Bob Sanders. Current and planned wildfire detection systems are impressive but lack both sensitivity and rapid response times. A small telescope with modern detectors and significant computing capacity in geosynchronous orbit can detect small (12 m2) fires on the surface of the earth, cover most of the western United States (under conditions of moderately clear skies) every few minutes or so, and attain very good signal-to-noise ratio against Poisson fluctuations in a second. Hence, these favorable statistical significances have initiated a study of how such a satellite could operate and reject the large number of expected systematic false alarms from a number of sources. We suggest a number of algorithms that can help reduce false alarms, and show efficacy on a few. Early detection and response would be of true value in the United States and other nations, as wildland fires continue to severely stress resource managers, policy makers, and the public, particularly in the western US. 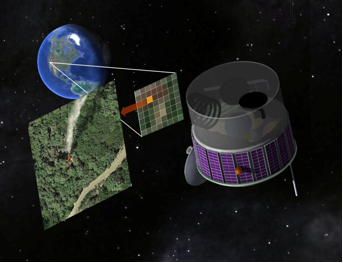 Here, we propose the framework for a geosynchronous satellite with modern imaging detectors, software, and algorithms able to detect heat from early and small fires, and yield minute-scale detection times. Open Access Journal Link. Press Release. KPIX spot. Check out these images from after the American fire, from the WorldView 2 satelllite from our northern SNAMP site. The blue boundary is our SNAMP site. This background imagery is a pan-sharpened WV2 image (0.5 meters, channels 7, 5, 3). The red color depicts alive vegetation (at least for the time being) and green-blue is post-fire NPV (non-photosynthetic veg). Thanks to Carlos Ramirez for the images. The post-fire imagery shows the heterogeneity of this fire - some spots burned all the vegetation, some spots have standing trees remaining. American fire as of 8-26-13The American fire is burning into our SNAMP study areas. It looks like our northern treatment and control sites have been burned through. 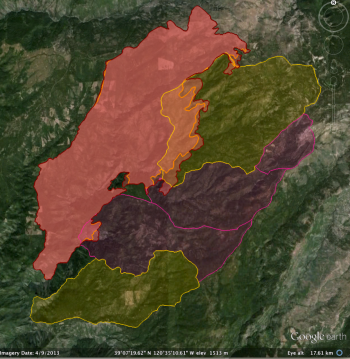 Here is a snapshot of our study site and the fire perimeter (red) as of 8-26-13. SNAMP control (yellow) and treatment (purple) watersheds are shown. American Fire Status from Incident Report as of 8-26-13: Fire Status: The south, west and north perimeters of the fire remainin patrol status. Some pockets of heat were found interior to the westside containment line and extinguished last night. Crews have completed burning operations adjacent to the Mosquito Ridge Road, along the eastern perimeter. These burning operations have consisted of fire fighters lighting low intensity (“cool”) fire with the intent of reducing ground fuels between the fire perimeter and the main fire. This tactic was highly successful as it reduced the potential of themain fire escaping containment lines. Crews continue to transition into detecting and extinguishing any remaining hot spots. With increased containment of the fire, crews have begun work repairing areas affected by fire fighting activities. This has included chipping material piled next to roads during fire line construction as well as identifying needs to construct water control devices along fire lines throughout the fire area. Forest visitors are asked to adhere to area and road closures. These closures are in place to protect visitors and fire fighters. The roads and areas that have been closed are unsafe due to fire-weakened, burned trees that pose a risk of falling, as well as frequently heavy smoke making visibility extremely poor. These areas and roads will be re-opened as soon as possible. We will keep you posted. This was originally posted on /. American fire perimeter (red) as of 8-20-13The American fire is burning into our SNAMP study areas as of yesterday. Here is a snapshot of our study site and the fire perimeter (red) as of today (8-19-13 perimeter in orange). SNAMP control (yellow) and treatment (purple) watersheds are shown. All SNAMP field crews are safely evacuated, with almost all field work completed for the year. From the Incident Report: "The American Fire burning in heavy fuels on extreme slopes about 10 air miles northeast of the community of Foresthill, California, and eight air miles south of Interstate 80 has grown to 14,765 acres. While the fire is predominantly SimTable animation of American fire spread - modeled thru 8-14 I am guessingburning on the Tahoe National Forest within the North Fork of the Middle Fork American River drainage, there is a potential, given changes in weather or fire behavior, for the fire to threaten areas near Foresthill. Active fire behavior continues on the eastern and southern flanks of the fire. Overnight, crews continued to build hand and dozer line to contain the active fire while evaluating future containment options. Firefighters will mop up and patrol containment line along Deadwood Road and Foresthill Divide Road south to the dozer line. Indirect line construction and mop up will continue down Deadwood Ridge. On the east side near Antoine, Manila and Screwauger Canyons, American fire as of 8-20-13 from ESRI onlinedirect and indirect line construction will continue, with support of retardant drops. Active fire behavior and roll out of burning material continue to be of concern, and will be closely monitored. Strong, erratic outflow winds and lightning may occur today, as the National Weather Service’s Red Flag Warning remains in effect until 11 p.m. Wednesday. Active fire behavior in very steep, inaccessible terrain makes preparation of contingency lines critical. Indirect attack is the safest way to manage fire in areas of steep and difficult terrain." 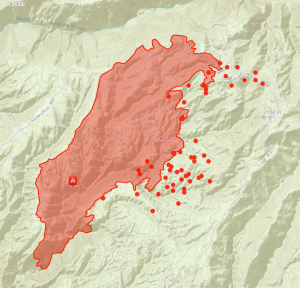 In the images to the left, both from ESRI online, there are a number of thermal hotposts in SNAMP territory American fire as of 8-21-13 from ESRI online(the red dots outside of the fire boundary) that were detected as of 10:30am 8-20-13 (upper image). As of 8-21-13 the MODIS hotspots indicate possible fire movement along Foresthill Rd to the east, and into the SNAMP control study area. Chips fire via SimTableWhile up at Forestry Camp, Mike DeLasaux turned us on to this site: SimTable. Apparently in the early days (and still today) sandtables were used to practice for wildland fire management. A few pictures are shown here. A nice tool developed to update the sandtable idea using digital data and fire modeling is SimTable. Their website also has some great visualizations of past fires with real fire perimeter data. For example, check out the spread of the Chips fire using their website (image at right). The fire was first sighted on July 29, 2012, burning about 20 miles (32 km) west of Quincy, California. It burned through the begining of September 2012, eventually burning about 75,000 acres in Plumas and Lassen national forests. In late August, a series of backfires along the eastern flank of the fire were lit (check out the forest treatments in purple on the map) to slow the spread. News article about the backfire here. The site is: http://apps.simtable.com/fireProgression/tests/chips/simpleOverlay.html. Here is the Chips burn scar from NASA. The Sierra Nevada Conservancy has just released a new report on System Indicators for Forest Health and Carbon Storage. This fourth report in the System Indicators series focuses on Sierra Nevada forests, and includes indicators related to Forest Health and Biomass/Carbon Storage on forest lands. In addition, this report describes the extent, character, and ownership of forest land in the Sierra Nevada Conservancy (SNC) Region. The lead author on the report is our Susie Kocher, from UC Cooperative Extension, and from SNAMP. NPR recently created a neat interactive web map depicting locations of large active wildfires (updated every 30 min) and current wildfire danger forecasts (Low to Extreme) for areas in the lower 48 states (updated daily). Check out the map here and the accompany news story here. Map was created by Matt Stiles, Stephanie D'Otreppe and Brian Boyer. 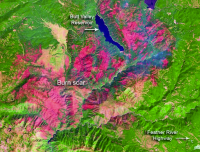 A nice example of remote sensing for fire: this visualization allows you to compare the utility of hyperspectral images to see through the smoke and map fire scars. The article is about a lightning strick fire in the fantastically named "Great Dismal Swamp" in Virginia. Hurricane Irene might put a damper on the fire. “Eight inches of rain will not put the fire out,” said Tim Craig, Fire Management Officer for the refuge. “It will buy us time to clear our way through the downed trees back to the fire zone after the storm.” Irene generously drenched the swamp with 10 – 15 inches of rain, but initial assessments show that the fire is still burning. Before the storm, the Lateral West fire was 35 percent contained. Smoke still rose from at least 30 acres after the storm though open flames were no longer visible and the fire did not spread under Irene’s strong winds, said local news reports. The sudden flush of rain left puddles that are still soaking in to the soil and may yet help extinguish the fire. See the interactive tool and article here. 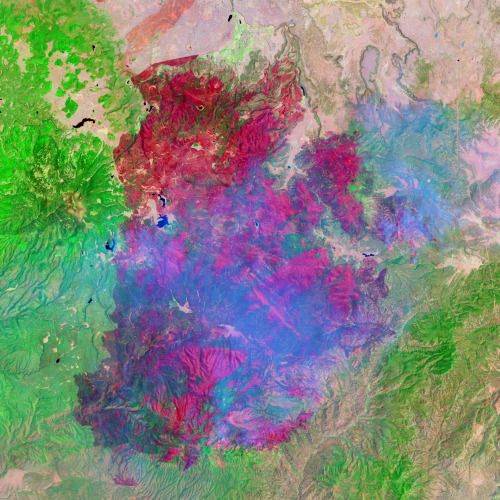 From the Nasa Earth Observatory: The newly burned land left in the wake of the Wallow Fire is dark red in this false-color image taken on June 15, 2011. The image, acquired by the Landsat 5 satellite, is made with infrared light. The slightly blue blur is smoke, and dots of bright orange-red on the south side of the burn are active fires. Unburned forest is green, and sparsely vegetated land is pink. By the end of the day on June 15, the Wallow Fire had burned 487,016 acres of forest in eastern Arizona and was 20 percent contained. Most of the fire activity was on the south side of the fire, away from the majority of the communities that had been evacuated. Among the places evacuated were Greer and Eager, labeled in the image. Irrigated plants (like lawns) are pale spots of green and buildings are tiny dots of blue. Most of the 32 homes destroyed in the fire were in Greer, where the fire clearly burned to the edge of the community. While the burned area encroaches on Eager in places, a buffer of green separates the community from the fire. From Marek. Really nice example of Google's newish data delivery scheme: on the fly graph of fires in the Tahoe area in the last 100 years. I am not completely sure where the original data comes from; the earlier stuff looks to be drawn from scanned news. We'll do some more sleuthing. Still, pretty amazing yield of data.